Age: 16 Class: 2-1 Date of Birth: September 29th Horoscope: Libra Height: 165 cm Weight: 49 kg Blood Type: B Special Skill: Aikido Favorite Thing: Trying hard Misaki is the heroine of Kaichou wa Maid-sama!. She lives alone with her mother and her younger sister Suzuna, because her father abandoned them, leaving them with a huge debt. Because of her father's actions, she has a deep hatred for most boys (except the gentlemanly type). She goes to Seika high school, which only recently became co-ed. It was an all-boy's school only a few years ago. Because of this, the student body is 80% male and 20% female. Misaki worked hard to become the student council president and "protect the girls." However, she has a secret. To help her mother pay off her father's debt, she has a part-time job... at a maid cafe! She doesn't want anyone at school to discover her, because she thinks that if they do, she will lose her authority as student council president. 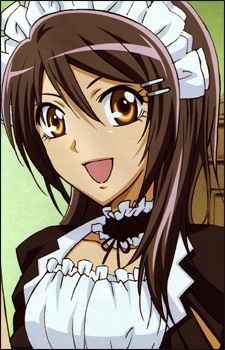 She then meets Usui, who discovers her working as a maid at the maid café. Misaki thinks Usui will tell the whole school about her working there. Instead, he keeps it a secret under one condition: Misaki has to be his personal maid for the day in order to stay the student council president and keep her part-time job hidden from everyone else. In the manga Usui and Misaki start dating. Ayuzawa is confused as to Usui's true feelings the whole series, but in the final episode, they both confess to each other and kiss.